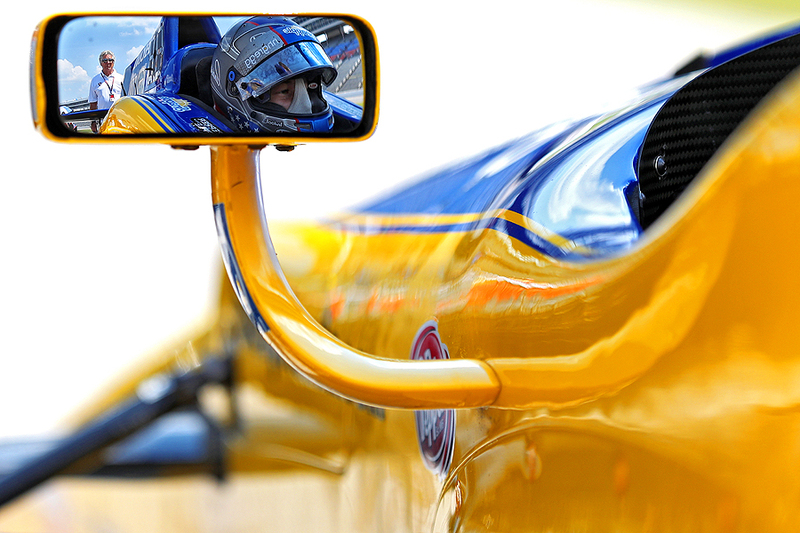 "Motor racing legend Mario Andretti looks on at grandson Marco Andretti, driver of the #27 Snapple Andretti Autosport Honda, in his car during Star-Telegram Qualifying for the Verizon IndyCar Series Firestone 600 at Texas Motor Speedway on June 10, 2016 in Fort Worth, Texas." There is nothing better than when everything lines up. Recently while documenting the Verizon IndyCar Series Firestone 600 weekend at Texas Motor Speedway, I was assigned to cover a handful of cars during a session of qualifying. This included drivers preparing, gearing up and getting into cars. The process can be lengthy, as IndyCar qualifying is one car at a time. So after grabbing images for your own assignment, you then have a lot of time to work pictures of other drivers, teams. With a last name like Andretti, everyone with a camera is drawn to the Snapple Andretti Autosport Honda. I waited a couple minutes for the photographer crowd to calm down around him before venturing back over for a rather standard mirror shot. As I squatted low to line the shot up, all while making sure I wasn't being seen in the mirror, I noticed racing legend Mario Andretti looking on at his grandson, Marco. A simple moment that lined up now gives the rectangle a little more shelf life for clients. 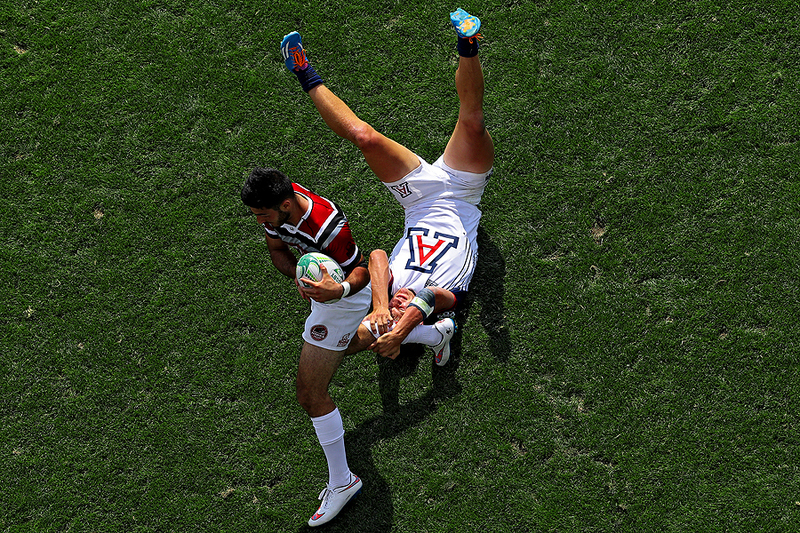 "Aram Keshgegian #5 of St. Joesph (left) eludes Shane Demsey #2 of Arizona during Day 1 of the Penn Mutual Collegiate Rugby Championships at Talen Energy Stadium on June 4, 2016 in Chester, Pennsylvania." Sometimes in sports it can feel like you're dragging a ton of weight around due to many different variables. Whether it's weather related such as extreme heat or cold, bad backgrounds at a venue, or other life events unrelated to the game. These things and more can make a regular match feel like a major challenge whereas it might not otherwise. Much like the image above for the collegiate rugby championships, you have to push on, keep running forward and work hard. By worrying about what might be dragging you down, you'll never be able to succeed visually. With that said, photographers are often the first to complain about things like weather, yet we should remember this minor nuances are only temporary. While that may seem difficult at the time - there is nothing worse than constant complaining. Prove not only to yourself that you can overcome the obstacles, but to your team, too. "Raymond Henley #2 of the New Mexico Vatos Snapchats on his phone with teammates under the grandstands after defeating St. Mary's College of Maryland, 31-7, in the NSCRO Final during Day 2 of the Penn Mutual Collegiate Rugby Championships at Talen Energy Stadium on June 5, 2016 in Chester, Pennsylvania." There is nothing like winning the big championship - and then sharing it with the world. For the second year in a row, I had the opportunity to document rugby sevens action for two days at the Penn Mutual Collegiate Rugby Championships in Chester, Pennsylvania. Knowing the lay of the land this time around I tried to change my style of visual coverage for us at Getty Images. And one thing I wanted to look for was a big moment of jubilation or dejection away from the field. After the New Mexico Vatos defeated St. Mary's College of Maryland in the NSCRO championship, I followed them under the grandstands to their makeshift locker room. I didn't think anything of it because they weren't in a proper locker room - and as excited as they were - simply taking off their jerseys wasn't a picture. But something told me to stick around, and I am glad I did. Moments later, Raymond Henley lead the team in Snapchat showing the world what they've done. It's this type of access, and these types of moments, that make sports special - and it would be possible without them allowing a total stranger into their world for a brief couple of minutes. "Starting pitcher Tyler Wilson #63 of the Baltimore Orioles and teammates stand with members of the United States Armed Forces before playing against the Boston Red Sox at Oriole Park at Camden Yards on May 30, 2016 in Baltimore, Maryland." Every year the same holidays occur. It can be just another day at the stadium unless you visualize how to document them differently. Some years you miss certain celebrations. Other years you photograph them and think how you could make it better. But having to wait an entire year to get the chance to shoot it again can easily make one forget what they wanted to do. For Memorial Day, I knew that service members took the field with players at Oriole Park at Camden Yards - much like most other ballparks around the nation. I totally forgot about that until when I walked to the field. It then hit me because I had forgotten my stool for the photo well. So I risked standing in the well or take a chance and photograph the beginning of the game from the nose bleed section. Glad I went up high because it gave the scene a very proud to be American feel, while also being graphic and clean.